Yesterday evening I was lucky enough to get a ticket for the opening night of the Sky Garden, a futuristic public garden on top of London's Walkie-Talkie at 20 Fenchurch Street. The views over the city that you get from the skyscraper are breathtaking and I think it is great that members of the public can go up and wander around for free. The photo above is one of the pictures I took while I was there. I'm really glad that I was among the first people who got the opportunity to visit. However, my feelings about the Sky Garden weren't all positive. Apparently when the building was first designed it only got planning permission on the proviso that there was a public park at the top. The Sky Garden as it currently exists doesn't really fit that description in my opinion. The fact that it doesn't have any grassy areas to walk on, which I feel is one of the essential features of a London park, is probably the least of my criticisms. My real issue is that to visit the Sky Garden you have to book months in advance for a 90-minute slot and there is a huge list of rules and regulations. No food and drink can be taken up there for a start - not even sweets and a bottle of fruit juice - the security guards run your bags through an airport style scanner and confiscate any edibles you might have forgotten you had on you. 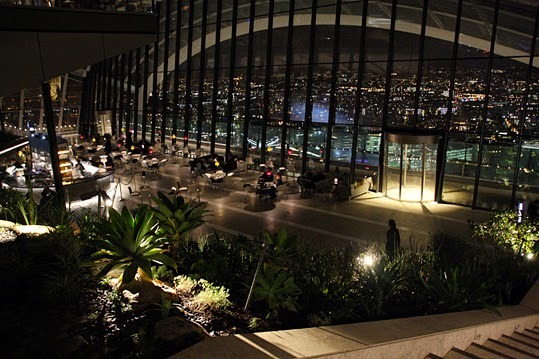 I guess what the owners of the Sky Garden want is for you to buy refreshments at the bar, restaurant or cafe up there, which of course aren't exactly cheap. But, if you can't have a picnic there, again is it really a park? Another rule is: "Proper decorum, personal behavior, and conduct is required from all visitors at all times in order to provide an equal opportunity to all visitors to enjoy the Sky Garden and restaurant experience." Apparently inappropriate behaviour (I prefer the UK rather than the US spelling for words when in London) includes "recreational activities". I'm guessing a pagan ceremony to honour the sunrise would get you chucked right out. Mind you, seeing as the time for free visits is normally between 10am and 6pm on weekdays and from 10am to 10pm at weekends, watching the sunrise from the Sky Garden would be out of the question. The bar is, of course, open much earlier and later for those who have the money. I don't want to sound too negative though - the view really is worth seeing. I guess if they had called the Sky Garden an observation platform I would have been perfectly happy. Calling it a public park is just inaccurate.